November 11, 2018 /0 Comments/in Guitar /by Megan L.
Looking for some easy jazz guitar songs to get you started? Jazz music can sound very complicated, at first. It requires a combination of skills like speed, precision, and endurance. There are many great jazz guitarists that can attest to that. While advanced jazz can take quite a while to work up to, beginner jazz guitar songs aren’t difficult or time-consuming to learn. In this article, we’ll provide videos and tabs for seven jazz songs that any beginner can start learning today. Let’s jump right into it! “Summertime” is a catchy jazz standard composed by George Gershwin. It was originally written for the opera Porgy and Bess. Sublime’s “Summertime” is based on this piece. “Autumn Leaves” is medium tempo jazz piece by Joseph Kosma. Here is a nice recording by Eric Clapton. Listen to the song, and then learn the chord progression. Be sure to look up any chords you’re unfamiliar with. Strum along with the recording and pay attention to the tempo! It’s not very fast. Take a look at the chords here. “Fly Me To The Moon” is a jazz standard made famous by Frank Sinatra. The steady quarter note pulse is a great way to practice changing 7th chords, a staple of jazz music. This is one of our favorite easy jazz guitar songs. Watch this video of the Jason Mraz version to find out why! You can find the the accompanying chords here. “Blue Bossa” is a bossa-nova piece with an infectious groove. (Bossa-nova is Latin-influenced jazz). This is a famous piece by Miles Davis. “So What” is a piece of modal jazz, which is built on modes rather than major and minor scales. If you’re not sure what a mode is, ask your guitar teacher for a lesson on them! “Nuages” is a piece of gypsy jazz by Django Reinhardt. Django played at incredible speeds with only two fingers! He lost his other two in a fire. Django’s solos and improvisation move at intimidating speeds, but the main melody of Nuages is easy to understand. 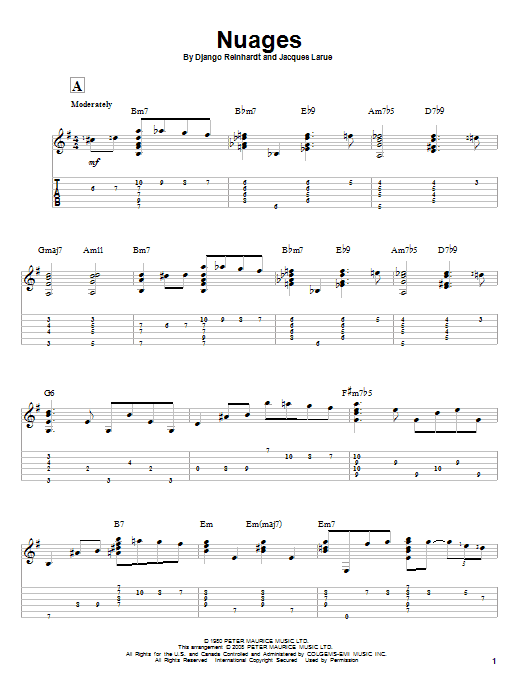 Here is a version of the piece for solo guitar. As you begin to learn beginner jazz guitar, don’t worry about the improvisations and embellishments (the fast, fancy stuff). Start by making sure you understand every chord in the song, then move on to the melody. Try learning one of these songs with a friend so you can both practice trading lead and rhythm. Once you learn some of these easy jazz guitar songs, you’ll be ready for more advanced playing. Even better, you’ll be better equipped to write your own jazz song. Have fun with your playing and make sure to practice every single day! Dylan P. teaches guitar, music theory, and music performance lessons in Independence, MO. He has trained in many genres of music and has experience teaching students with learning disabilities. Learn more about Dylan P. here!